The Philips 326E8FJSB provides a very attractive package that involves a 32-inch VA screen with excellent quality for a wallet-friendly price. 32-inch 1440p monitors are fast becoming popular due to the demand for more space and immersive visual experiences that don’t cost as much as an ultrawide. The Philips 326E8FJSB leaves out a few creature comforts which thin its specifications list, but does it punch above its price range where it matters the most? The Philips 326E8FJSB is a budget monitor so it doesn’t come with all the pizazz usually associated with premium displays. The cabinet has a black semi-gloss finish which gives the product a nice appearance which is a bit challenging to maintain. The display’s bezels are thicker than the usual, but it’s easy to ignore the minor fault if you consider the price. The rear panel is relatively flat save for the bottom part where the Philips 326E8FJSB’s innards and functionalities are concentrated. This treatment gives the monitor a flat and thin side profile which makes it easy to flush mount to a wall. Monitor arms shouldn’t have any troubles holding the massive display in place since it weighs less than most 32-inch displays we’ve tested. Build quality for the Philips 326E8FJSB is reasonable since each of the parts is well-made and there are no uneven seams which are readily visible. The plastic feels a bit thinner compared to variants that cost twice or more, but there is no unwanted flexing. However, we noticed a bit of wobble on the display, but the monitor’s light weight is also a factor in that. The Philips 326E8FJSB lacks a few creature comforts which we have come to expect from modern monitors for all types of use. The omission, however, is excusable in this regard since the model breaches the usual bottom pricing of 32-inch displays at its launch. The cabinet for the Philips 326E8FJSB is supported by a tilt-only metal stand with an arc-shaped base that has a considerable width or reach. The good news is you can remove this mechanism in favor of computer mounts that have 100 x 100 VESA adapters. For most purposes, the extra cost isn’t warranted, but it would be nice to be able to point the massive screen in a direction you prefer. We love that the brand used a joystick for OSD manipulation on the Philips 326E8FJSB’s bottom bezel. The gadget is easy to reach and quite responsive, so tweaking the monitor or switching between its various inputs should be easy as peas. Most budget options have to do with clacky buttons, so this is a huge plus for this device. Even the connectivity panel on the Philips 326E8FJSB is simplified since it doesn’t include extras such as USB ports. You only get DisplayPort 1.4, dual HDMI 1.4 slots, DVI, and a VGA port. There is a 3.5mm audio jack for audio passthrough, but there are no speakers included in the package. 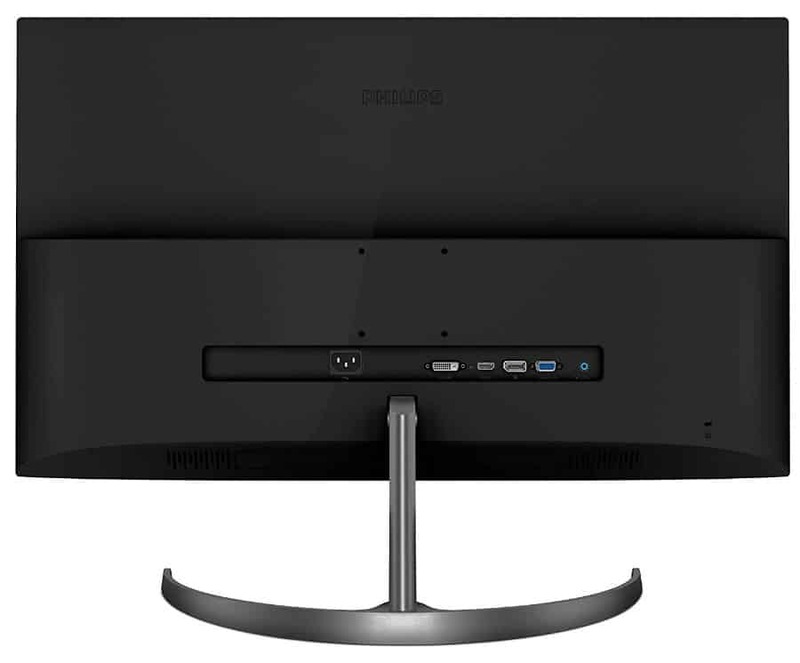 The Philips 326E8FJSB boasts a 32-inch VA panel with a 2560 x 1440 resolution, 75Hz maximum refresh rate, and 4ms response time. The backlight is a bit dim at 250 cd/m2, while the contrast ratio is specified to reach 3000:1 as expected on most VA panels. VA monitors have become a popular choice for entertainment purposes due to the latter which gives images and colors better ranges and depth. 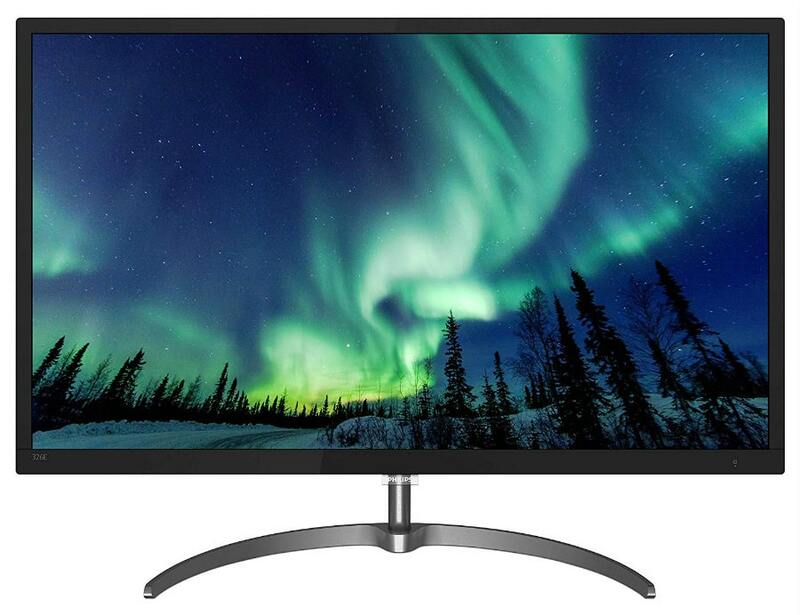 Of course, the first characteristic you will notice on the Philips 326E8FJSB’s larger screen is the looser pixel pitch which is comparable to a 1080p monitor at 24 inches. It isn’t as crisp as 27-inch variants like the Asus PG279QZ, but the edge softening on images isn’t as profound as most think. There is still plenty of detail since the pixel count is still higher than your usual full HD display. The Philips 326E8FJSB offers a few image filter modes, but its best one is its default setting which renders 114% of the sRGB gamut with an accuracy of DE 2.1. The image looks perfectly balanced save for a bit of oversaturation in some colors like green. That score is already fantastic by any standard, but it can be improved to DE 1.5 with a few tweaks of the OSD. On the other hand, the Philips 326E8FJSB’s gamma and grayscale performance will benefit greatly if you tweak the RGB settings in the OSD. You also need to set the gamma options in the OSD to its 2.4 level to get a gamma average that is closer to the ideal point. Doing this will add some punchiness to the colors instead of a flatness that is most noticeable on brighter shades. The backlight on the Philips 326E8FJSB could use some improvements since it tops out at 215 cd/m2 which is too low for some users. But what’s great about the screen is it reaches a 2750:1 contrast ratio despite the illumination handicap. Black luminance is quite low, so darker images appear inky and satisfying. Panel uniformity for the Philips 326E8FJSB could also use some improvement since there are slight hotspots due to minimal leaks at the corners. Deviations could reach as much as 17% in brightness, but there is no clouding and you have to look closely at an all-black image to see the flaw. The screen’s excellent contrast and black luminance takes care of this issue when playing games or watching movies, so it shouldn’t be an issue for most. Motion handling is also good for the Philips 326E8FJSB especially if you consider that its a VA monitor with a limited refresh rate. The ghosting we noticed is too minimal to break the monitor’s viability for gaming, plus it can be minimized using the middle settings of the Overdrive option in the OSD. Only a 144Hz VA monitor is faster, but you can’t get one at this price point. 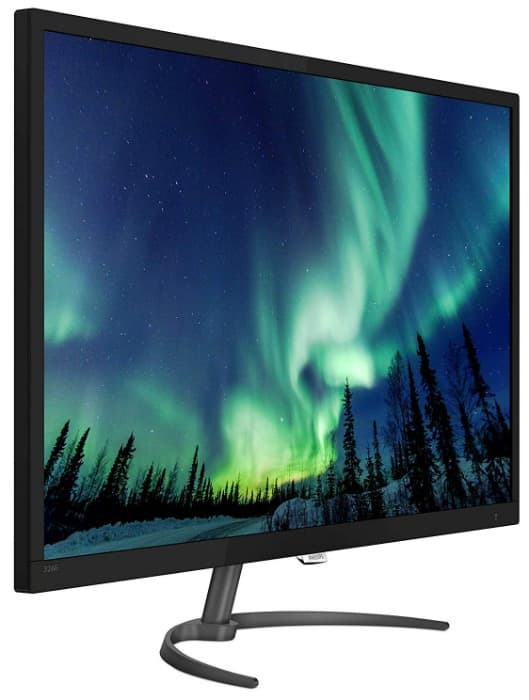 The Philips 326E8FJSB is a FreeSync-compatible monitor with a functional range of 48Hz to 75Hz. The threshold isn’t a lot, but we can consider it a sweet spot where FPS will mostly place if you have the right GPU and graphics settings. Input lag averages at 11ms which means the monitor’s only handicap in competitive play is its limited refresh rate. The Philips 326E8FJSB is one of the best budget monitors we’ve tested in recent times due to its fantastic image quality by default or post calibration. The large QHD screen is perfect for watching movies or enjoying immersive titles such as Sekiro Shadows Twice or even the Division 2. This product is a better option compared to HP Omen 32 which has been quite popular in the casual gaming crowd. Of course, you have to live with a few imperfections and cut corners if you decide to save big bucks and get the Philips 326E8FJSB. It doesn’t have the extras we usually covet from premium screens, but you do get excellent performance and value for every dollar spent. This option is a must buy if you are looking for a budget display that trades blows with products that cost twice or more. I just bought this monitor after reading this review. I’m mostly happy with the monitor but I noticed quite a bit of ghosting while playing games. I placed it in the “faster mode” but I don’t really see any difference between any of the three modes (fast, faster, fastest). Any other solutions? Hi, G! The Philips 326E8FJSB is a fantastic value monitor, but the blurring you are seeing is a given limitation of VA panels with a lower refresh rate. Only a screen with a 144Hz refresh or higher will be better in this regard.